Sammy’s Cafe, a hip, indie eatery in Utah has begun using the Strata Swipe with Square enclosure, by ArmorActive, as their iPad point-of-sale security solution. After testing this POS system in one of their eateries, Sammy’s installed the enclosures in all of their locations within just three weeks. Sam Shultz using iPad POS in new cafe. It’s saving me money on the back end. It’s saving me money on the front end. It’s amazing. Located in cities throughout Utah, Sammy’s Cafe, a hip, burger joint, known for their rich and decadent Pie Shakes and popular among college students, has found yet another way to set themselves apart with their new iPad® POS systems by ArmorActive®. After only three weeks of running a successful trial in one of their Utah locations, the owner of Sammy’s Cafe, Sam Schultz, has chosen to replace all Sammy’s Cafe POS systems with simplified and sleek iPad POS systems by ArmorActive. As a restaurateur known for finding innovative ways to draw crowds while also saving money, Sammy’s Cafe Owner, Sam Schultz has taken the meaning of POS to another level in all his locations. 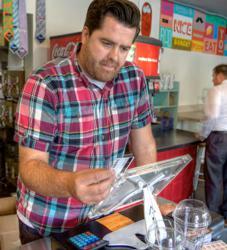 Not only does he use the ArmorActive iPad POS system to ring up orders and receive credit card payments through the Square card reader app, but also uses the same iPad device to stream music through the store’s PA system, manage his Groupon deals, and plug into his customer rewards program; helping to keep the atmosphere young and inviting for new and current patrons. The Strata Swipe with Square security enclosure used by Sammy’s cafe is a solution by ArmorActive designed specifically for merchants who want to utilize the iPad as their POS along with Square as their POS application. The secure enclosure hardware allows them to use the iPad without the risk of theft or damage to the iPad. Sammy’s Cafe’s iPad POS enclosure came equipped with table mounts from ArmorActive’s Gravity line, which allow for the iPad to be flipped into the customer’s view for signature and price verification. The enclosure’s sleek, modern look and unparalleled security and ease of use make it possible for Sammy’s to tap into the amazingly powerful Square Card Reader app for the iPad. Together, the Strata and the enclosed card reader provide a unique and fun POS solution for a unique and fun restaurant, all while keeping costs down. Famous for their delicious burgers and Pie Shakes, Sammy’s Cafe is an eatery dedicated to art, music, and great food. With four location across Utah and Idaho, Sammy’s has gained a reputation for great food and bringing crowds of great people together.